Remembrance of Things Past, and the danger of too much reading. This is a mental recollection of an exquisite painting, smaller than 8 X 10, that I once saw in my friend Sophia’s place. 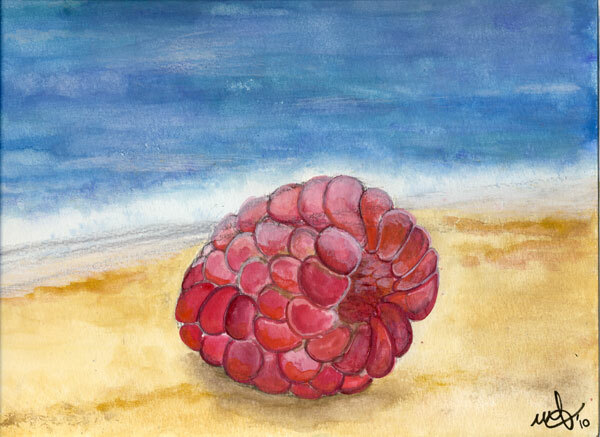 It was an oil painting, varnished, and the raspberry on the beach looked so large, lustrous and luminous. You could tell the translucent quality of the skin. This is my humble attemp at recreating that piece in watercolor: oil paint allows for more luster, and maybe one day I will try that as well, even though most of my painting are done in acrylic . Sitting in Cafe’ Italia, with my watercolors, and my ‘model’ perched on a napkin, envisioning faraway beaches and the quality of the water in Calabria– and feeling glances from patrons–I realize Art is a wonderful privilege, an ability to lose one’s self and a giving of kind, compassionate time to one’s self. Like every privilege, to me at least, art is also a responsibility. Of course the endless list of chores awaits, yet I felt what art offers is more than escapism or absorbing creativity produced by others , as in savoring a book or basking in a glorious movie ( I love both): with art we create our own narrative, as in writing a book vs. reading one. Does it make sense to be then a bit exhausted after a creative session? Perhaps it is all about resistance…learning to teach the wrist and mind to embody ‘effortlessness’. Not to mention the refinement of the medium. This was the fourth serious attemp/experiment with watercolor I have done. I will never forget, while following ‘The Artist’s Way’, one was to go for a week without reading. Reading has been in the past a way to procrastinate creating in the first person, a way to be vicariously creative . We must watch that. There is so much wisdom in your post. I am a life-long reader but I catch myself reading Watercolor magazines rather than painting. I tell myself I’m learning by reading but I am sure it is not as much as I would learn by doing. That is one reason I started blogging to give myself that extra little push. Your painting is lovely. I love this painting 🙂 its so good !